Miradoro Restaurant launches its new fall menus to celebrate the harvest season and the start of the festive period. Taking the best of the Okanagan’s bountiful harvest, Chef Jeff Van Geest has created a new selection of hearty entrées such as elk bolognese with a rich tomato & ground elk sauce, spaghetti alla chitarra and parmigiano reggiano ($26) and the locally reared Wild Moon organic pork chop with crackling, crab apple mustard, fried polenta, baby kale and charred leeks ($35). Get into the celebratory spirit at Miradoro’s Communal Table Dinners, which take place every Tuesday at 6.30pm throughout October, November and December. Chef Jeff Van Geest creates themed multi-course dinners that bring together friends old and new over an unforgettable feast for just $35 per person. Upcoming themes cover cuisines from Spanish tapas (November 15) to Moroccan street food (December 13) and an Italian family Christmas (December 20). Other highlights include a wild foraged mushrooms dinner (October 18), handmade pastas (November 22), vegetarian courses (December 6) and a year-end feast (December 27). Start planning Christmas party season with Miradoro’s special menus that create a winter wonderland of seasonal delights including porcini mushroom soup with chestnut crème fraiche, followed by roast turkey “porchetta” with brown butter mashed potatoes, cranberry mostarda, Brussel sprouts and pancetta gravy, and a pumpkin tarte tatin with cinnamon gelato. Party menus cost $45 per person, plus tax and gratuity. Heartier partiers can enjoy a $65 menu that includes canapés of burrata with pickled wild mushrooms, albacore tuna crudo and duck empanadas. Dishes feature vegetarian favourites such as porcini mushroom soup with chestnut crème fraîche, and winter squash risotto with root vegetable fritto misto and mostarda di Cremona. Entrées showcase slow cooked sockeye salmon with potato & clam ragu, kale and salsa verde, as well as beef short rib with smoked polenta, coffee roasted carrots, crisp onions and braising juices. Finish with a chocolate bodino with salted dulce de leche cream and chocolate shortbread for a decadent end to the day. 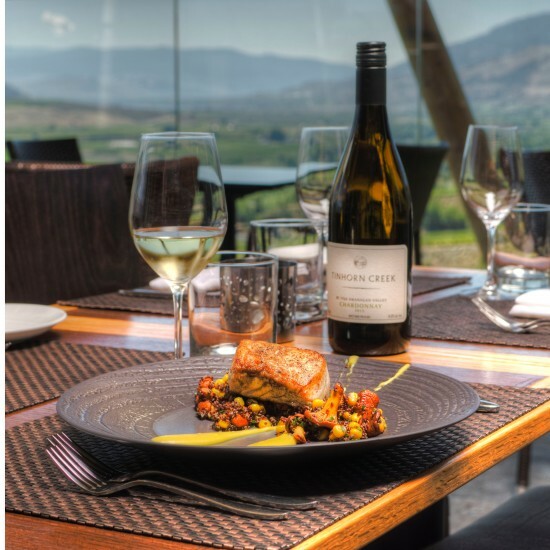 For more information about winter events, visit the Tinhorn Creek Vineyards’ events page at http://www.tinhorn.com/Events and to book your party call (250) 498-3742.